The Rebel Sweetheart. 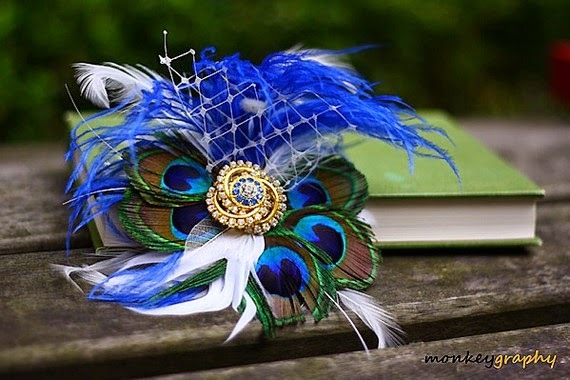 : Fashion Pulse | Peacock Feathers. Peacocks are some of the most colorful and beautiful animals in the world. Everyone has witnessed the marvelous show of feathers at the zoo or in a wild environment. Every feather has an "eye" designed to scare off predators, and in the modern world, women like to wear peacock feathers in their hats or on their clothes for decoration. The peacock bird continues to be highly celebrated and decorative in all ancient and modern societies. The following is a guide that helps you make the best use of these beautiful peacock feathers. People often buy bird and peacock feathers to place in hats. Girls and women love to place these feathers in their hair wreaths and bands, too. Placing these plumes in clips and barrettes is more difficult, but certainly possible. These feathers are the most visible and scenic items found on costumes, so it is always good for decoration. Peacock feathers are some of the most colorful and unique elements to any wedding, too. You may want to include a peacock flower in a bouquet of wedding flowers on the table, around a pillar or anyplace else where decorations are found. The beautiful green, gold and blue color stands out well among the flower petals. Also, place the feathers in the centerpieces for the reception tables for a unique look, or you can even attach them to wedding invitations, pens or bridal dresses. For many fashion designers, peacock feathers are always good accessories to have. Many of the designers have attached the feathers to create colorful green and blue bustiers and tops for dresses. The dresses are so bright and decorative that they get stares as soon as they walk into a room. You can be sure, if you are wearing a dress with peacock feathers, it will be noticed. There are certain things in nature that are good for decorative purposes. Animal fur coats, leopard skin prints and peacock feathers are only a few items to consider for fashion reasons. These plumes are found on some of the most beautiful birds in the world, and the colors are bright and almost metallic as the feathers shimmer in the light. For a big occasion like a wedding or party, you may want to buy bulk peacock feathers from a reliable source like Zucker Feather. Find dozens or hundreds of them for your use in hats, hair accessories, wedding decorations, and more. Your use of peacock feathers is only limited by your imagination. That dress is really pretty! We used to have peacocks that lived near our house and they would walk around our neighborhood leaving their beautiful feathers behind! I've always thought peacock feathers were just gorgeous! They would be pretty in a hairpiece; you're right. Love the peacock theme. Nice style. Peacocks are so beautiful. I love their feathers but I'm not sure that I could pull off wearing them. beautiful dress! I love that they sell them in bulk and you can get them for fun crafts, masks, etc. I so adore Peacock feathers because they are so gorgeous. Peacock feathers incorporated into a wedding is an awesome idea. This dress is just beautiful for sure. Thanks for sharing. I'm totally in love with that peacock dress. how beautiful!